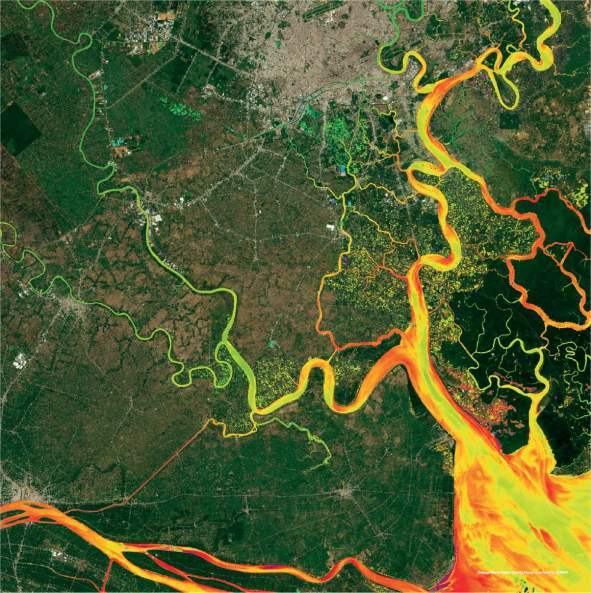 Consistent and independent water quality information can be derived extremely cost-efficient and with a minimum of logistical effort for millions of inland and coastal waterbodies, using measurements from satellite-based earth observation (EO) sensors. UNESCO, through its International Initiative on Water Quality (IIWQ) under IHP, supports Member States in responding to water quality challenges and has launched the first comprehensive worldwide water quality online portal for freshwater systems, lakes and rivers, retrieved from satellite-based earth observation data, to assist with global water quality assessment and capacity building. UNESCO has selected EOMAP (mit hyperlink zur homepage) to build the online portal for global water quality assessment for the International Initiative on Water Quality (IIWQ) of UNESCO-IHP. where users can find worldwide water quality data products.The web application enables users to interactively browse and access satellite based water quality measurements. Reports including statistical measures over a time span of one year can directly be exported, for any user defined station and parameter within the time series regions. Environmental managers, politicians and scientists gain a global perspective on water and the environment through the UNESCO-IHP IIWQ World Water Quality Portal produced by EOMAP. They will discover how earth observation can help monitor the effects of pollution on our water cycle and raise awareness of the importance of environmental monitoring to policy and decision makers, diplomats and the general public. As a web-based service users can quickly obtain measurements at freely selectable virtual stations for any location worldwide. A comprehensive range ofsatellite-based water quality parameters such as turbidity, chlorophyll and indicators for toxic Cyanobacteria blooms can be mapped globally with weekly or even daily sampling frequencies under cloud-free conditions. The UNESCO-IHP IIWQ World Water Quality Portal also includes functionalities to select different time periods dating back over the last three decades. Historic measurements are providedat a 30m resolution for selected regions of each continent throughout 2016, and can be continued with various spatial and temporal resolutions for every country. The Itaipú hydroelectric dam located right at the border between Paraguay and Brazil impounds the Paraná River over a distance of more than 170 km and can hold approximately 29.54 billion tons of water. To begin the dam construction, it was necessary to divert the flow of the Paraná River, which is one the largest rivers in the world, with its basin covering more than 10% of the whole Brazilian territory. The dam construction took eight years and did not only have direct impacts on the economy, but also on the ecology and geography of the area. 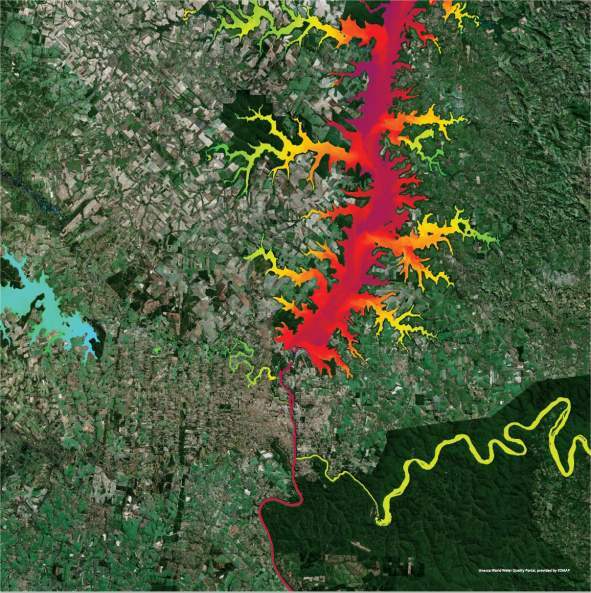 The IIWQ World Water Quality Portal visualizes the interaction between many different waterbodies like the Itaipú Reservoir and the Paraná River and also its tributaries Rio Acarya and Rio Iguazú and Arroyo, Uruguay. Information on sediments in the water column can support efficient planning on localized comprehensive measurements, environ- mental impact or directive monitoring by characterizing the water quality in dams and interconnected rivers. Lake Sevan in Armenia is one of the largest high-altitude freshwater lakes of Eurasia and located at 1900 m above the sea level. The recently completed Semkir Reservoir in the Caucasus region of Azerbaijan and the associated river systems with the River Kur are also located within this focus region. These waterbodies have been intensively used for irrigation in the past century, resulting in severe ecological impacts for Lake Sevan. 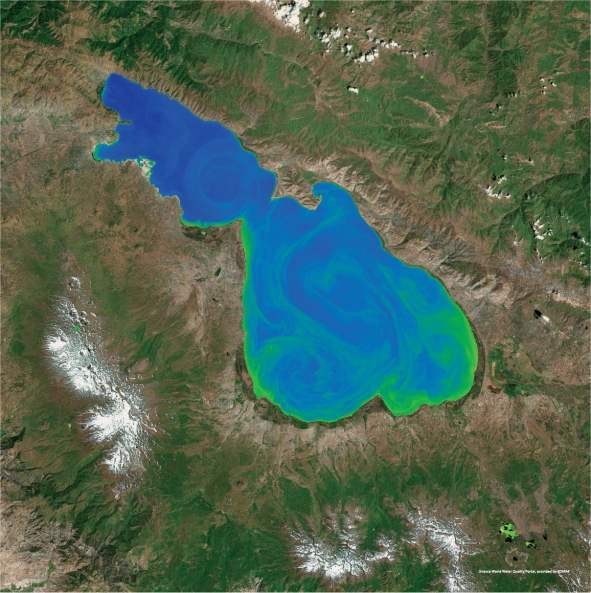 The IIWQ World Water Quality Portal shows the phytoplankton distribution in Lake Sevan, forming stunning eddies within the lake as shown in this image. Other small lakes of the Caucasian Highlands can be identified as green spots in the landscape, indicating medium phytoplankton concentrations. Phytoplankton is a key part of oceans, seas and freshwater basin ecosystems. When present in high numbers, some varieties may be noticeable as colored patches on the water surface due to the presence of chlorophyll within their cells. The Egyptian Lake Nasser and its southern end, Lake Nubia, were created as a result of the construction of the Aswan High Dam to staunch the Nile, the world’s longest river. Lake Nasser is one of the largest man-made reservoirs and was constructed to control flooding, provide increased water storage for irrigation, and generate hydro- electricity and to improve the extremely vulnerable food and water security situation in Egypt. As in other dams, sediment trapping causes changes in downstream water quality, with significant impacts on coastal erosion in the Nile delta, which reversed from growth to a shrinking process since the closing of the dam. 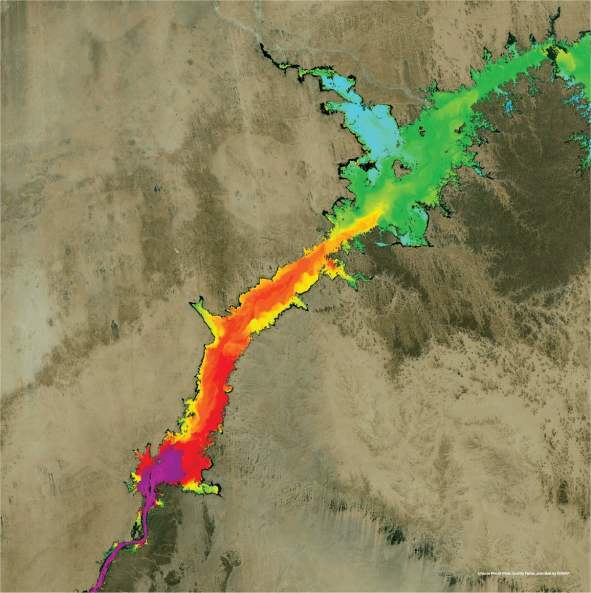 The IIWQ World Water Quality Portal demonstrates the seasonal cycle of turbidity, but also the distribution and suspension of sediments in the Reservoir and the river. It is clearly visible that great amounts of sediments are trapped within the Reservoir, since the turbidity decreases significantly from the river mouth down to the dam. Turbidity is caused by particles suspended or dissolved in water that scatter light making the water appear cloudy or murky. More than 7,700 lakes are found in Florida and they occur in a variety of ecological settings. Water colour and quality can vary widely in these lakes. Small spring-fed lakes in Central Florida normally contain the clearest water with the highest visibility commonly exceeding six feet, while others, for example the ones found in Cypress marshes, are stained black from the tannin from the trees. The physical, chemical, and biological diversity of these lakes complicates lake assessment and management, but makes this region especially interesting. 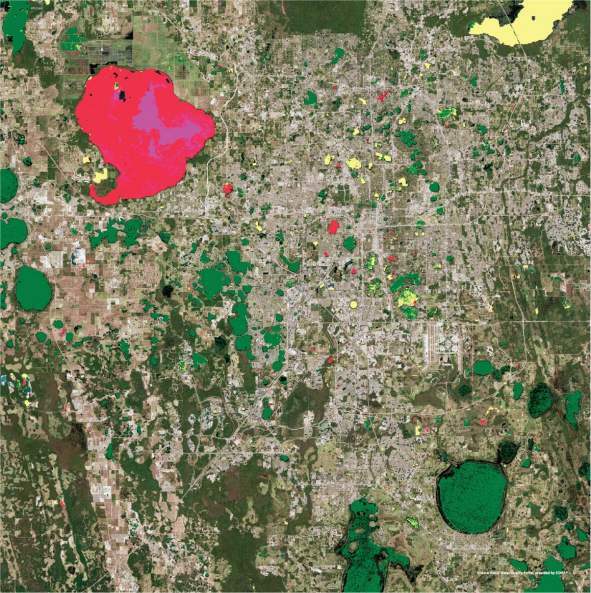 The IIWQ World Water Quality Portal provides the region around Lake Apopka, Lake Harris and Lake Griffin and clearly depicts the differences in the trophical state of the lakes of Florida. The Harmful Algae Bloom Indicator supports to identify the actual status of the waterbody, showing bright alarming colors when harmful algae are most likely to be present. In Harmful Algae Blooms (HABs), natural toxins are produced by cyanobacteria. These are a concern because they affect not only humanhealth and aquatic ecosystems, but also local and regional economies. Osaka Bay located in western Japan is part of an inland sea which is connected to the Pacific Ocean as well as the neighboring Harima-nada Sea to the west and the Kiisuido Strait to the south. Within the metropolitan area, which also includes large cities such as Osaka, Kobe and Sakai, a population of many million inhabitants combined with a rapid industrialization and urbanization caused serious water pollution issues since the 1960s. Artificial islands have been built for airports and industry, recreation and education. After the establishment of special laws, the pollution within Osaka Bay has gradually been reduced and the environment has improved to some extent. 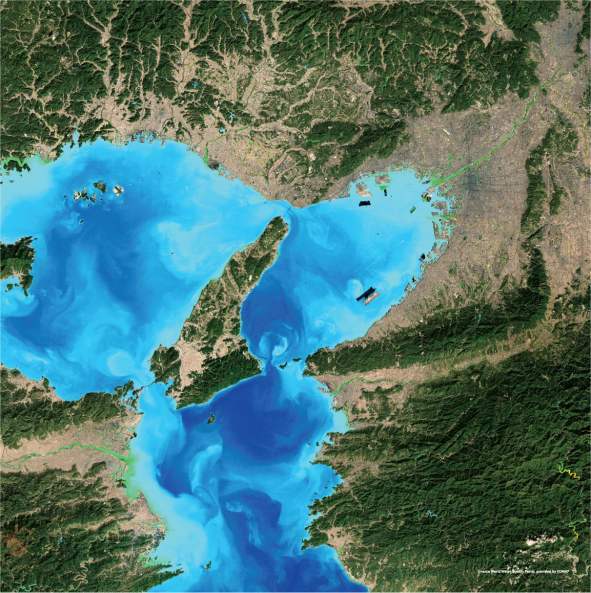 The IIWQ World Water Quality Portal shows the turbidity levels and patterns within Osaka Bay and its surrounding waterbodies, giving an indication over the improved water quality despite the heavily populated area. The measurement of turbidity is a key test of water quality. With an area of over three million square kilometers, Sakha is the largest sub-national governing body by area, comprising half of the Far Eastern Federal District of Russia. It is known for its extreme climate, with the Verkhoyansk Range being the coldest area in the Northern Hemisphere. The entire region is underlain by permafrost, with only isolated unfrozen patches in the south. The area occupies the basins of great rivers flowing to the Arctic Ocean – the Lena, Yana, Indigirka and Kolyma – and also includes the New Siberian Islands between the Laptev and East Siberian seas. With almost no population, this region is mainly influenced by the local environment and climate change, with rapidly rising temperatures as the most important driver of environmental change over the last decades within this area. 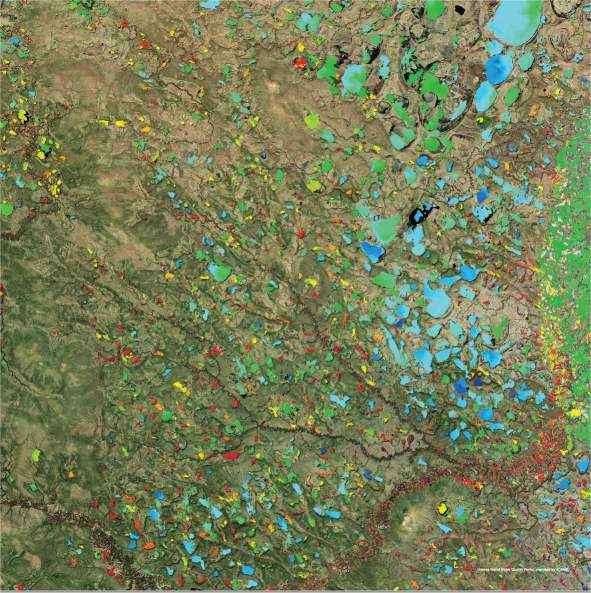 The IIWQ World Water Quality Portal shows the region near the Kytalyk Reserve with its numerous lakes and melting ponds as well as the rivers Allaicha and Bjorjoljoch and the related total absorption product. This demonstrates the impact of organic and inorganic components within the water resources, originating from the substances released by the permafrost. Each of those waterbodies has its own dynamic depending on the specific local environmental conditions, leading to the patchwork-like look of the region. Mecklenburg-Western Pomerania is well known for its natural landscape and biodiversity, but also for extensive agricultural areas. The Mecklenburg Lake Plateau is the largest coherent lake and canal region in Germany and has a coastline extending over 2,000 km. 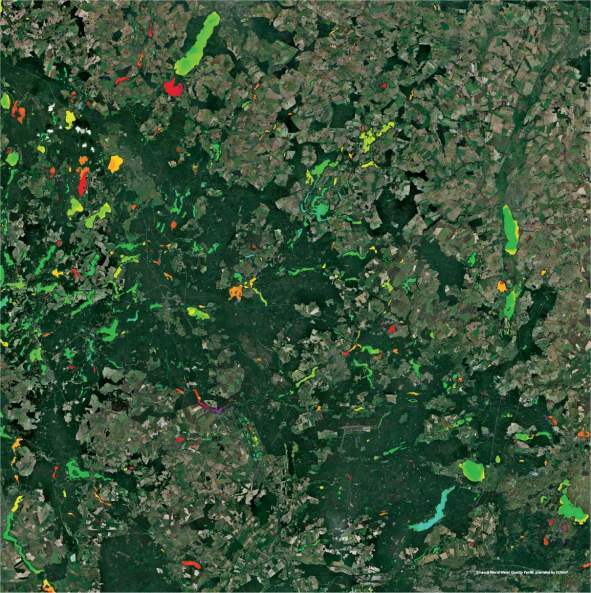 The IIWQ World Water Quality Portal shows the Chlorophyll status in the Mecklenburg Lake Plateau. The Chlorophyll pigment of phytoplankton is a key indicator for the trophic status of lakes. It is thus used for monitoring and reporting on the ecological status. Many lakes are impacted by nutrient inputs from chemical fertilizers used in intensive agricultural practices, resulting in express growth of biomass and Eutrophication. Eutrophication causes changes in plankton species and the ecosystem function, one reason of increasing Harmful Algae Blooms (HABs), as shown in the IIWQ World Water Quality Portal. These changes are a significant concern because they affect not only the health of people and aquatic ecosystems, but also local and regional economies. From China to Vietnam, the Mekong river provides a vital lifeline for millions of people in half a dozen countries. Driven by the nutrient rich sediment from the upstream catchment areas, the Mekong Delta is one of the most fertile and productive deltas in the world. For Vietnam, it plays an important role to food security and the national economy, as it contributes 30% of the country’s GDP. However, the Delta is in danger due to the increasing number of upstream dams. Nutrient-rich sediments are trapped within the reservoirs and can therefore no longer reach the Delta, causing significant economic losses in the Delta. Another danger for the Delta is the increasing salinification through the climate changes causing sea level rise. The IIWQ World Water Quality Portal shows the turbidity level of the Mekong Delta region. The turbidity is directly linked to suspended sediments and used as a sediment proxy.